By nature, I am not a fan of traveling. People with anxiety issues often aren’t because travel disrupts the comfortable routine that you have set out for yourself. You have to go to new places on a new schedule or no schedule and a million things can go wrong. So when Boyfriend Ken started talking about taking a Big Vacation this summer, I admit to feeling a little antsy. 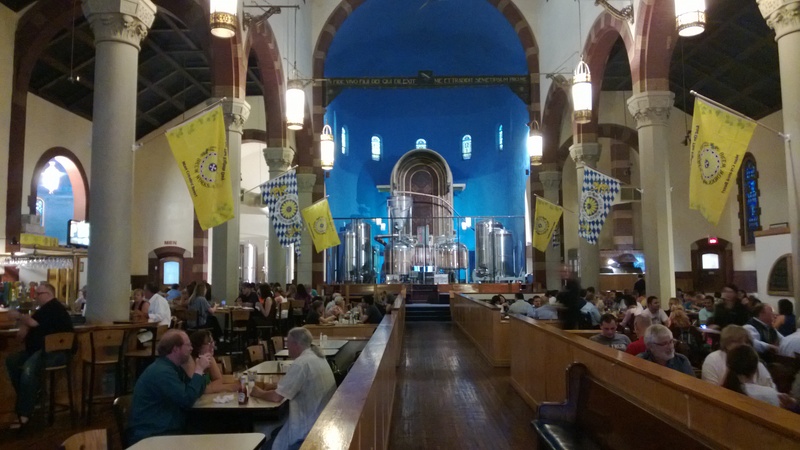 But then he sweetened the deal by listing all of the brewpubs we could go to and I was sold (mostly…anxiety still poked its head out time and again). We decided to head to Boston–home of our slave owning, racist, misogynist, alcohol loving Founding Fathers (well, home of some of them). 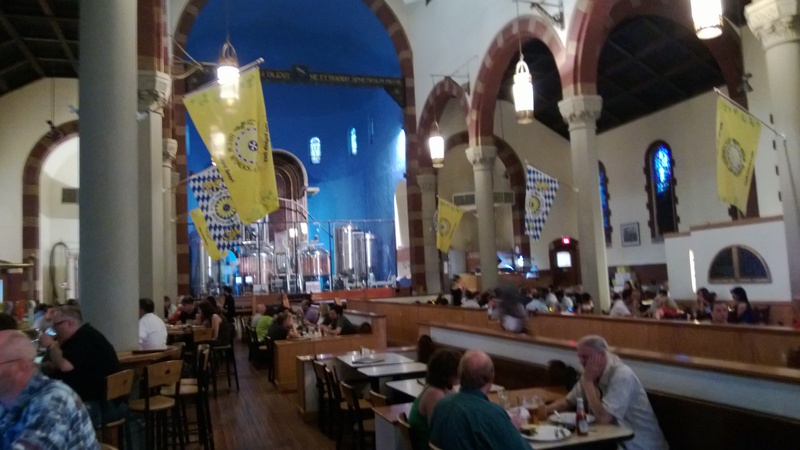 Along the way, we decided to take a small detour to Pittsburgh to visit Church Brew Works. 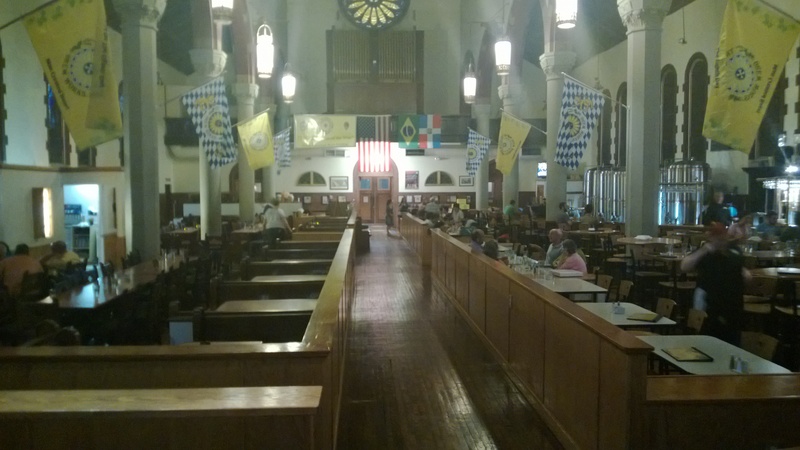 I know you are hoping that this means that the pub is in an old church. I am delighted to tell you that it is! 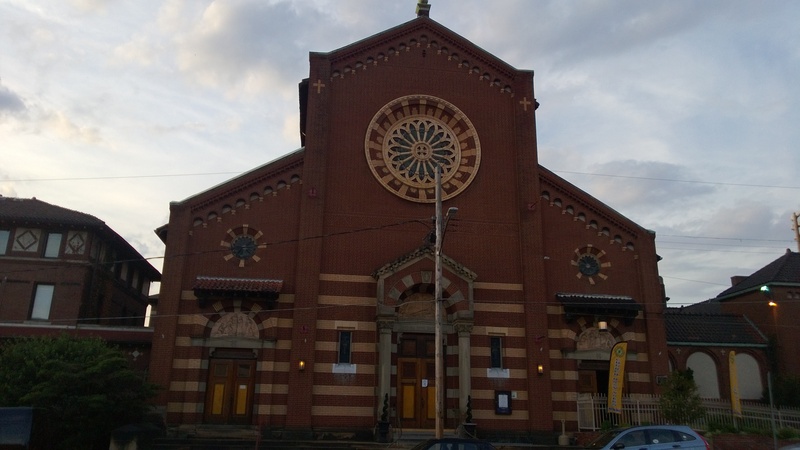 According to the menu, the church (named after St. John the Baptist) was built in 1902. Like many other areas, the neighborhood experienced population loss and parishes closed. 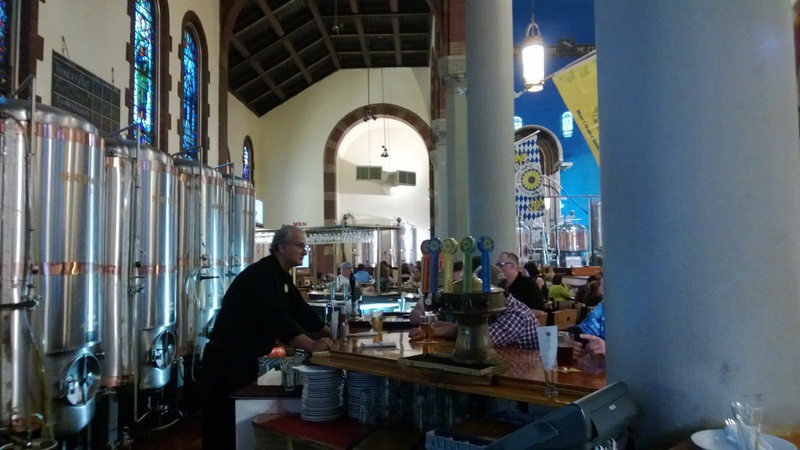 In 1993, St. John the Baptist shut its doors and stayed empty until it opened as Church Brew Works in 1996. I believe that this repurposing makes God smile. As you might imagine, the interior of the pub is absolutely beautiful. I could imagine brides walking down the aisle and baptisms and people lighting candles and whatever else one does in a church. Take a look! Kenya AA Pipe Organ Coffee Pale Ale ~ I can honestly say that this may be one of the best beers that I have ever had. Maybe it’s because I have only had coffee stouts (and maybe a coffee porter or two) and never experienced the delicious taste of pale ale + coffee. The coffee did not overwhelm the taste but was definitely present in every mouthful. Amazing combination of tastes! 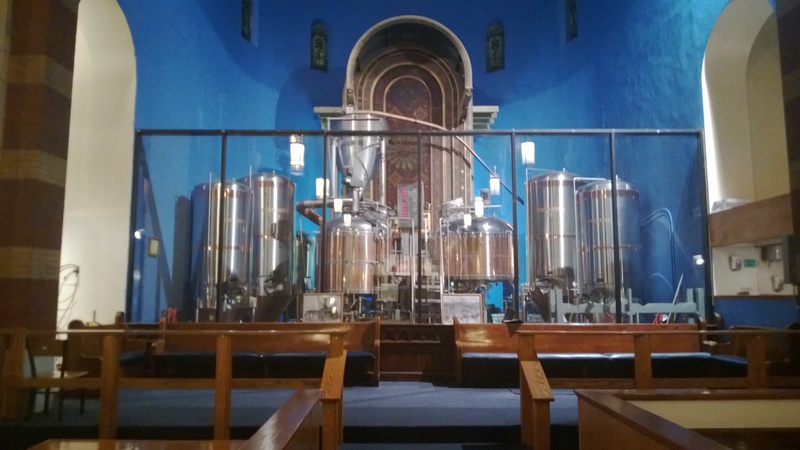 Pipe Organ Pale Ale — Likewise, the actual pale ale was delicious. Very well balanced between malt/hop and a nice crisp finish. Inside Out Stout — The story is that they brewed this beer to combat all of the people who are all “Ooooh, I no like dark beer! Me like IPAs and light ale!” Okay, not quite like that but they did brew it to try to get the anti-dark beer crowd on board. So what you end up with is a stout that is lightly colored. I ain’t playin. It had the taste of a stout but looked like an ale. I was completely confused because I only have so many brain cells that can work at any given time and this threw me for a loop. Once I adjusted myself (ha ha, it’s funny because I don’t have balls to adjust) I enjoyed this tremendously. If you know someone who is prejudiced against dark beers, this would be the one to turn them. Unholy Matrimony — An American ale made with rye, my personal favorite beer grain (or any grain for that matter). Lovely hoppy notes, crisp taste, light mouth feel and RYE! There was malted barley too (I think, or else wheat) but I picked up lots of rye tastes and I was oh so happy. This beer would be great on a boat or at the beach. The food was excellent as well which made the entire visit perfect. My only regret is that we were just passing through and couldn’t spend more time (and drink more). Ah well…there’s always next time! !